Maryland is still the undisputed U.S. champion when it comes to drawing sprawling, weirdly shaped congressional districts, according to a soon-to-be-released national study. 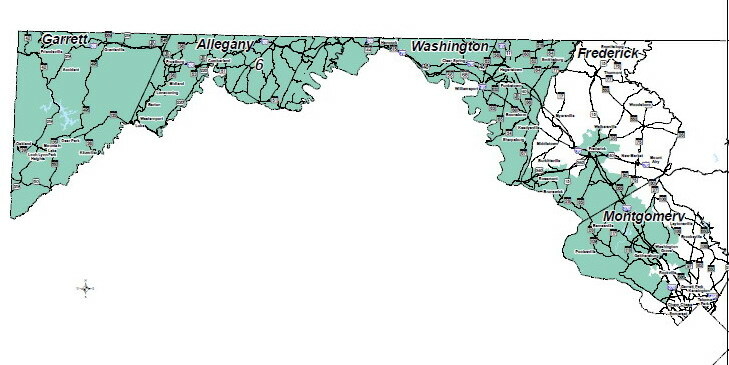 Maryland has the least compact congressional districts in the nation, based on four mathematical tools for compactness, Azavea, a geographic information services firm in Philadelphia, plans to report in a white paper. 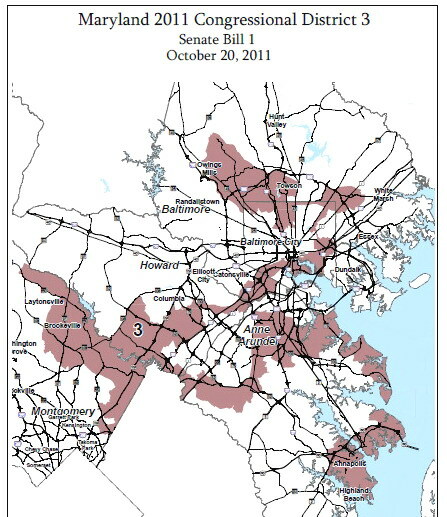 The 3rd Congressional District, zigzagging from Towson to Silver Spring to Annapolis is the third least compact of the 435 congressional districts in the United States, the study found. The 6th Congressional District that runs 177 miles from Potomac to Oakland at Maryland’s far western border is the 9th least compact. The 2nd Congressional District that includes parts of Anne Arundel, Howard, Baltimore and Harford counties is the 11th least compact congressional district. The 3rd is now represented by Democrat John Sarbanes; the 6th, by Republican Roscoe Bartlett; and the 2nd, by Democrat Dutch Ruppersberger. Voters in Maryland will get to approve or overturn the new lines on the Nov. 6 ballot in Question 5, which was put on the ballot through a petition drive by opponents of the partisan gerrymandering in the new plan. Now that information on all the new congressional districts redrawn after 2010 Census is in, this Azavea study confirms the company’s data reported by MarylandReporter.com in December. The study was done as part of what the company sees as it as “social mission,” said Azavea GIS analysts Daniel McGlone. The only two districts in the country less compact than Maryland’s 3rd are North Carolina’s 12th and Florida’s 5th, McGlone said. Both of those are majority minority districts, drawn to give a minority group more clout. That does not apply to any of Maryland’s districts, where minority concentrations in Baltimore City and Prince George’s County are actually diluted to aid white Democratic incumbents. The firm used four different commonly used measures of compactness found in academic literature. Maryland’s unusual shape and the squiggly coastline of the Chesapeake Bay could account for some lack of compactness, but McGlone said straightened and squared off some of those lines due to inlets and rivers, drawing a line down the middle of the bay, for instance, rather than following the coastline. Based on their national study, McGlone found, “districts drawn by independent commissions do tend to be more compact,” as in Iowa and California. California in particular just instituted such a process, and its new districts are “dramatically more compact,” and are drawn without regard to where incumbents live, placing some in the same new district. Maryland and Pennsylvania, on the other hand, have “total partisan control of the process,” and their lines are less compact, McGlone said. 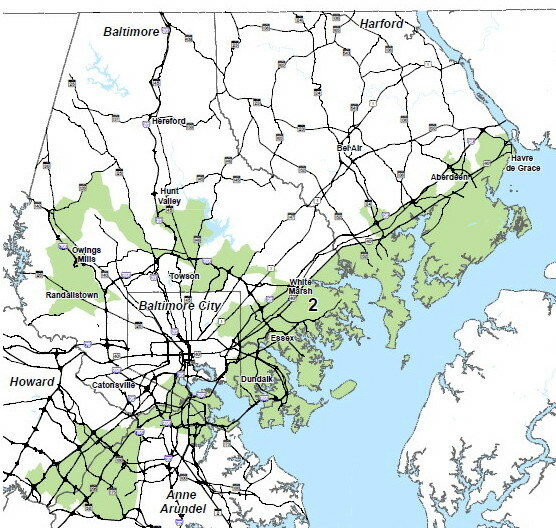 In the Towson-Cockeysville area of central Baltimore County, three of Maryland’s eight incumbent members of the U.S. House of Representatives live within a few miles of each other: Sarbanes, Ruppersberger, and Republican Andy Harris, in the 1st Congressional District, the 25th least compact district in the nation and which includes all of the Eastern Shore. A fourth congressman, Elijah Cummings, lives in Baltimore City nine miles south of Sarbanes’ Towson home, but shares representation of the majority African American city with Sarbanes and Ruppersberger.